Note: The photos show the darker male (left) and the female (right × 2). Distribution: Very common in forest areas throughout Southern Africa. Hyde, M.A., Wursten, B.T., Ballings, P. & Coates Palgrave, M. (2019). 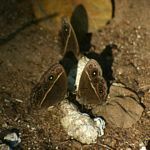 Flora of Mozambique: Lepidoptera - Butterflies and Moths: Bicyclus safitza safitza.